Complete with mighty oaks, babbling brooks and friendly, experienced leaders, our beautiful purpose-built camps are the perfect place to connect with nature in a fun, adventurous and magical way. Enjoy Forest School, Bushcraft and exceptional Outdoor Activities for all ages. No-one is too young or old for an adventure at Hidden Woods. 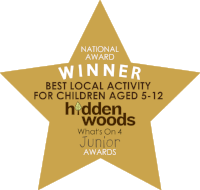 From wonderful parent and toddler sessions and carefully crafted outdoor birthday parties to wild stag do’s, willow weaving and innovative forest school programmes for schools and educational groups, every session at Hidden Woods is truly one of a kind. Each offering is thoughtfully and expertly designed to embrace the developmental opportunities that our natural playground provides, offer a blissful bolthole to escape the noise of modern living, and ensure bags of fun along the way. We regularly host bespoke events for schools, groups and families too. If you have a group you’d like to bring to the woods do get in touch and we will be delighted to explore the possibilities with you. Enjoy your roam around our website, if you have any questions please drop us a line and we look forward to welcoming you to the woods very soon. Join us for our monthly morning of fun and adventure in our wonderful woodland playground. We’ll be taking a short walk to one of our lovely camps, where we’ll get stuck into natural crafts, games, camp fire cooking, singing, free-range play…or maybe just relaxing by the fire! Oh, and did we mention our incredible mud kitchen?! Full days of fun and adventure in our wonderful woodland playground, for children aged 8 and over. Full days of fun and adventure in our wonderful woodland playground, for children aged 5 and over. Sign up to receive our latest news, offers, competitions and more! Thank you for entering your details. We’ll be in touch shortly to confirm your subscription.